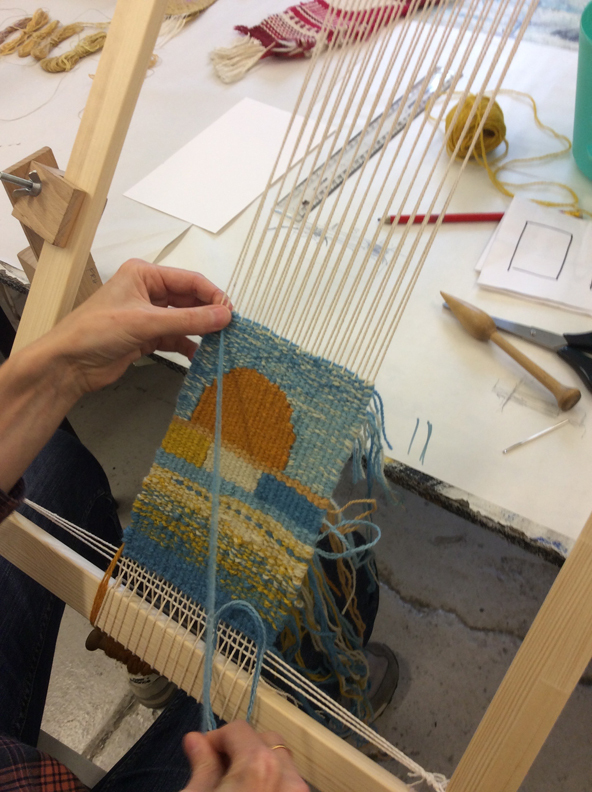 This 4 day summer school for beginners and developing weavers will introduce you to the process of woven tapestry, before going on to experiment with colour, woven textures and unusual materials. We will begin by using traditional materials of a cotton warp with wool weft. Setting up a small frame loom and considering the variety of warp materials and settings required for different designs. As we begin to explore the process of constructing a woven tapestry you will learn how to control the weaving tension, keeping strait edges. Working with a simple colour scheme you will weave a small sample discovering how to create shapes, angles, lines and mixing colour yarns. As part of the workshop you will be encouraged to develop your own ideas and designs for weaving. Keeping a visual diary or sketchbook, we will consider a range of approaches to help you develop your own personal language. Warping a up a simple frame loom. Selectin of the correct warp/weft thicknesses. Basic tapestry techniques: creating shapes, lines and blending colours. Students will work individually, at their own pace and will be supported with class demonstrations and group discussions. By the end of the workshop you will have the confidence to work independently to develop your personal weaving style. Fiona Hutchison graduated from the tapestry department, Edinburgh College of Art in 1985. She exhibits regularly in the UK, Europe and internationally. As well as teaching many independent workshops and mentoring emerging artists she also teaches tapestry weaving and stitched textiles for department of Short Courses at Edinburgh University.